In any campaign, big money players get the most attention. 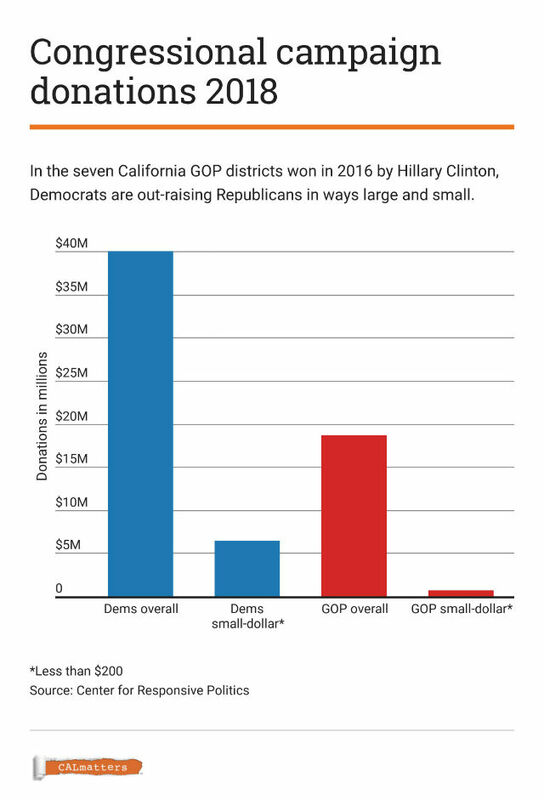 But Democrats running in California’s seven most competitive congressional districts are vastly outraising Republicans in small-dollar donations, according to a review of campaign money compiled by the Center for Responsive Politics. It’s a display of voter enthusiasm that can pay long-term dividends for beneficiaries. Overall, Democratic candidates running in the seven GOP-held seats where Hillary Clinton beat Donald Trump in 2016 have raised $40 million to the Republicans’ $18.7 million. That’s a stunning turn of fortune from 2016 when Republicans running in those seats raised $17.7 million to the Democrats’ $5.7 million. 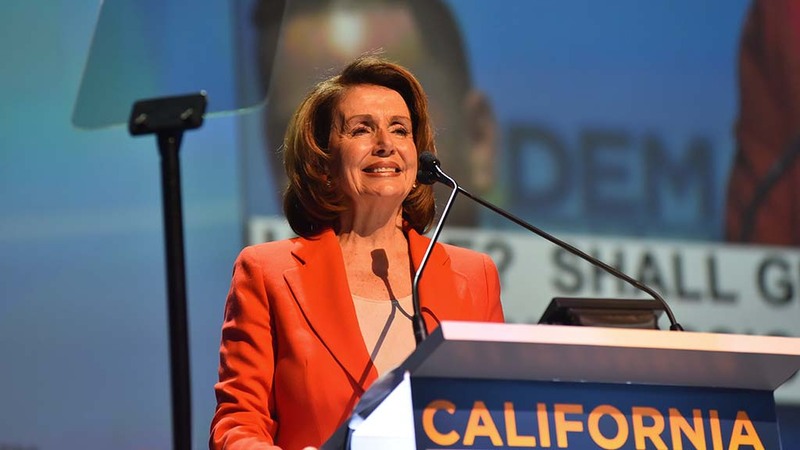 Democrats running in those seven districts raised $6.4 million in donations of less than $200, almost 10 times the $671,000 raised by Republicans through the first three quarters of 2018, campaign finance reports show. Altogether, Republican Congressman Jeff Denham of Turlock raised $4.1 million to Democratic challenger Josh Harder’s $6 million. Only 1.6 percent of Denham’s money is in small-dollar donations, while nearly 18 percent of Harder’s came in small amounts. Republican Congressman Steve Knight of Palmdale raised $2.1 million, but less than 2 percent has come in small increments. Knight’s Democratic challenger Katie Hill raised $6.26 million, including 21 percent in increments of less than $200. Republicans have used outside spending funded by wealthy donors as an equalizer, although Democratic groups and funders including the League of Conservation Voters and New York Mayor Michael Bloomberg are spending heavily to flip seats. Donors who give less than $200 aren’t identified by name in federal disclosures, and may not live in the candidates’ district. But candidates know who they are, collect their email addresses and regularly send them solicitations. Not all donors can afford to give the maximum $2,700 under federal law. But candidates can return to small-dollar donors multiple times to help fuel their campaign efforts, ranging from television ads to get-out-the-vote drives. They also know that people who give money vote and volunteer, if not for them then for candidates in their home districts. The phenomenon extends to districts where no Democratic expert thinks Democratic challengers have any prayer of winning. Democrat Audrey Denney has outraised Republican Congressman Doug LaMalfa of Richvale in a deep red district in far Northern California, $888,000 to LaMalfa’s $810,000. Almost 40 percent of Denney’s money, $350,000, has come in small increments, compared with 2.8 percent of LaMalfa’s money. Little known Republican Omar Navarro raised $546,000 in small sums in his long-shot challenge against Democratic Congresswoman Maxine Waters of Los Angeles. She and Trump regularly tangle. Tulare County Congressman Devin Nunes has used his close alliance with Trump to raise his profile nationally, and to raise money—$10.5 million for this election, almost half of it in small-dollar donations. Challenger Andrew Janz has raised 54 percent of his $7.2 million from small donors in the first half of the year. Republican Congressman Tom McClintock of Elk Grove raised 24 percent of his $1.5 million from small donors. McClintock, whose tenure in office dates to 1982, has cultivated his list of GOP regulars for decades. Overall, however, challenger Jessica Morse has outraised McClintock, pulling in $2.8 million.